This past weekend I sailed from Fareham to Emsworth and back with a friend from Cambridge, and while aboard (and under way!) I assembled and attached the incomplete pendulum and was able to test some aspects of the Hebridean wind vane self steering gear that I have been constructing since last Monday. Before setting out, I finished making and attaching the counterweights. These balance the vane and push rods so that wind pressure is able to twist the pendulum. John Fleming’s plans involve creating counterweights by setting lead shot in polyester resin. But Dad has a better idea. He found a couple of old doorknobs and we filled them with lead instead. I tapped 10mm threads into the handles, then tapped 6mm threads into some 10mm threaded rod, so that the counterweights could be bolted to 6mm threaded rod on the Hebridean. 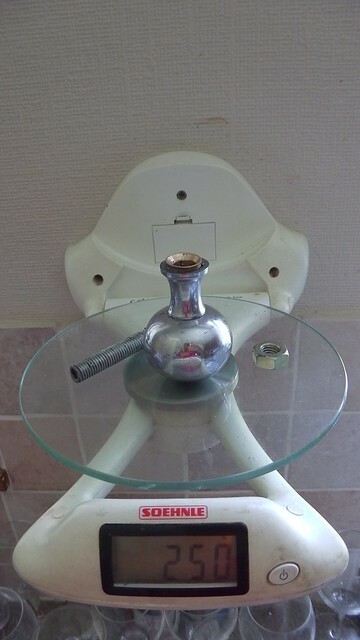 This also allows for some adjustment in their position with lock nuts. I attached the upper counterweight to the vane and fiddled with it until the vane just returned to vertical. It’s then that I found out exactly what the “grub screw” is for. It tilts the upper counterweight arm so that you can get the vane vertical. 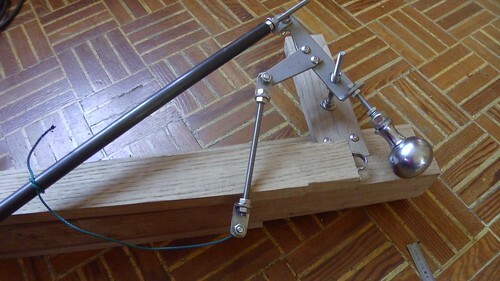 The lower counterweight balances the push rod mechanism. You need to detach the vane and pendulum, but hang the pendulum push rod so that you get the right weight. You then position the lower counterweight until the main push rod moves up and down with minimal force. With these things done, I took the frame and pendulum aboard Tammy Norie. 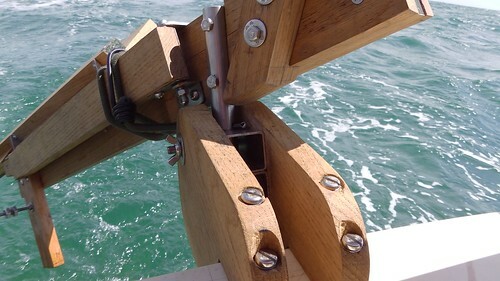 While underway I attached the pendulum sides and hinges. 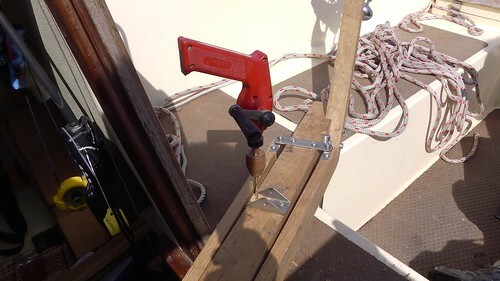 Drilling oak with a little hand drill is slow going, especially when the helm is tacking every few minutes! The results were very satisfying. 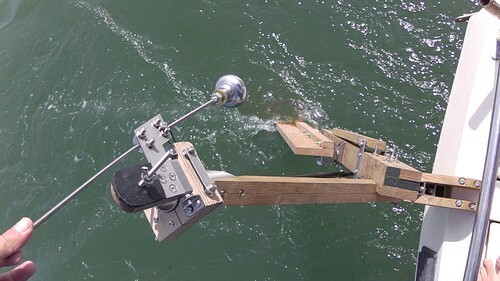 I was able to get the pendulum into the water while under way and see how it moved the whole gear when twisted. This kind of testing also revealed problems. I left the end of the extension proud of the trunk, to keep that end of the cross-lap joint strong. Unfortunately, it clashes with the mount and prevents the pendulum being fully lifted out of the water. I’ll need to trim it down. There’s another issue with the pivot and mount. 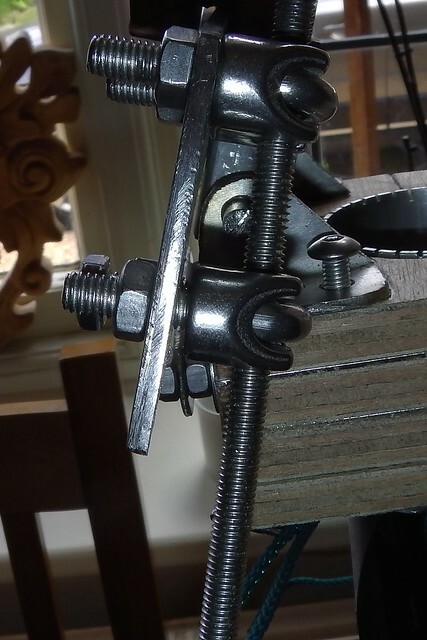 I made the mount as a sandwich (as recommended) but this means that the split pins keeping the pivot in the mount clash with the sides, preventing the Hebridean from rotating. I’m not sure what John intended here. I notice that his boat has the mount in a different orientation so perhaps he didn’t notice this problem. Later on I was able to attach the whole push rod linkage to the pendulum. 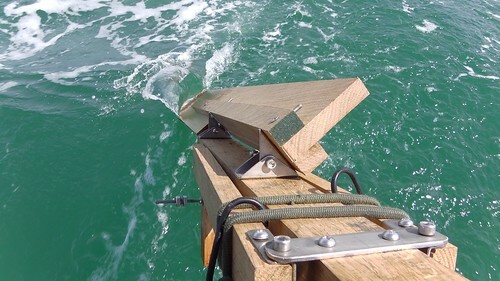 Once that was done it was possible to steer the Hebridean by wiggling the vane counterweight rod. I even have a video of this bit! Unfortunately, this last test was taken just before we had to moor up, so I didn’t have time to test using actual wind. As it was we only just got unloaded before the tide dried out Tammy. We even had to push the rowing boat through the mud to get home. I’ve taken the pendulum back home to Cambridge to shape it at home when I’m home from work. Thanks Antoine! I’m planing my trip to the Netherlands this week.